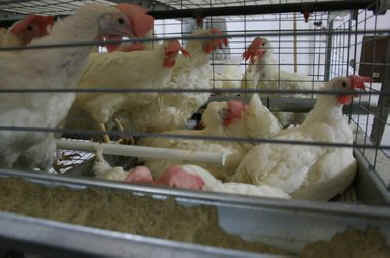 For its part, the Humane Society agreed to give up on a push to ban cages entirely . . . and would agree not to conduct undercover investigations at large egg farms unless it was aware of especially egregious practices. Replace barren battery cage over the next 18 years with “enriched” battery cages with slightly more space for the hens (ideally in some future fantasy up to one square foot for each caged hen) along with tiny perches and dustbathing areas; Prohibit forced molting of hens by food deprivation to manipulate egg production; Set toxic atmospheric ammonia level standards; Require egg cartons to inform shoppers of the housing system in which the hens who laid the eggs in those cartons lived, e.g. “eggs from caged hens,” “eggs from cage-free hens,” or “eggs from free-range hens”; Mandate “euthanasia” of “spent” hens (whatever that means in the context of agribusiness); Prohibit the sale of eggs and egg products that don’t meet these standards. Many animal advocates fear that any effort to reform agribusiness practices will placate the public with illusions of “humane” treatment of farmed animals having no basis in the reality of actual production practices. They fear that advocacy for a compassionate vegan diet is undermined by campaigns that seek to mitigate some of the cruelest abuses of an inherently animal abusing industry. They fear that whatever welfare reforms are enacted into law will not be enforced regardless, and that all or most efforts to reform animal agribusiness are a betrayal of the animal victims and amount to deals with the devil. All of these fears are reasonable. An additional reasonable fear in this particular case is that, should a federal law be enacted, it will be a diluted version of the initial proposals, and the battery cage, albeit “enriched” with tiny furniture including nestboxes that are actually just plastic strips, will be established. Once the U.S. egg industry invests a projected $4 billion dollars into converting to “enriched,” so-called “colony” cages, and those cages with their millions of tiny furnishings have been installed, that system will be firmly in place for the remainder of the 21st century, and probably far beyond. Acceptance of cages for laying hens, however euphemistically “enriched,” is a HUGE STEP BACKWARD, in our opinion. Unfortunately, victories for organizations do not necessarily translate into victory for animals, and this is how we view the current deal. We dissent from the view that HSUS’s agreement with United Egg Producers is “a step in the right direction.” We will continue to educate our members and the public to understand that the only true way to animal welfare – to animals faring well – lies in eliminating the demand for animal products in favor of vegan food. We hope you will join us.